An initiative to revive the lost art of Patta Chitra Katha : A thousand year old traditional folk art of storytelling in the original visual language, hand printed on dried patta leaves and handloom cloth using characters from ancient Indian Mythology. The roots of Patta Chitra Katha can be traced back today to two remote villages of Orissa on the East Coast of India. This short film is a modern day Chitra Katha in animation that celebrates the intricate form of this historic hand printing craft, that was handed down from generation to generation, until it got lost somewhere in the advent of machine printing. Arjuna the Mythological Archer adorns this first ever handmade version of The Great Indian Yellow Pages, in a vivid story that simplifies online yellow pages and encourages online transactions through the life of Arjuna in 2008 AD. A Short Film that bridges Mythology with Technology. Supported by Sulekha.com, India's largest Yellow Pages & Classifieds. Created by Famous House Of Animation & JWT India. "A little unknow fact, kept secret from more than 1000 years, this quaint religious town (Puri - 350 miles from Kolkata (Calcutta)) also was the inspiration of an art form called : Patta Chitra Katha. The legend goes that this all started with an annual temple ritual that required the deities to be displaced for cleansing. Patta Chitras were used to temporarily fill in their place while the ceremony was performed." "Just like the Madhubani paintings from North Bihar, Patta Chitra Katha is an indegenous art form represented by mixing tamarind seed paste with rice powder and applying it on the face of a white cloth to create the canvas! Fine brushes made from the hairs of a mongoose or rat or sometimes even a buffalo(!) is what the artist now needs to colour his imagination." "This exhibition of traditional Orissa patta chitra paintings (on cloth) draws inspiration from sources as varied as the Geetagovida as well as ancient palm leaf manuscripts. The heritage series has been especially painted by the doyen of traditional Puri paintings, 'Shilpaguru' Ananata Maharana along with his family members." "On the occasion of the 60th anniversary of India's independence, Creative Commons India is organizing a short film contest, on "Better governance through Right To Information"." The plan: Contestants will be invited to make a short film up to 5 minutes in length in Hindi or English based on the dramatization of a true story on -- "Better governance through Right To Information". The top 5 films will be given exciting awards and chosen for viewing at Avenues at a special prize distribution ceremony. " I asked on the Sarai Reader list, and had a couple of informative responses - thanks very much Kshmendra, Budhaditya, Prem, Raja, Rama, & Samantak !!
"""" Patta chitras are miniature paintings, used as wall hangings with religious themes as their subject matter. 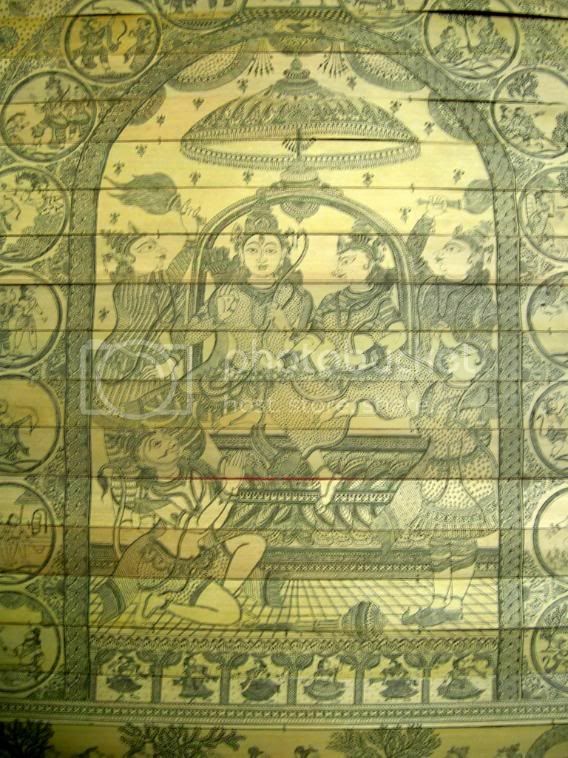 Legends from the lives of Lord Krishna are mainly depicted on this specially treated cloth known as Patta.""""" Someone proficient in the language Oriya (hopefully from this List) should be able to clarify whether PATTA is Leaf or a Cloth. Chitra Katha = Story telling through pictures. In this case I presume the pictures would be the paintings on (as referenced by you) Leaves (Palm Leaves). carrying the piece by her "Painted Folklore - Tradition of Chitrakatha". Patachitras - The tribal, the folk and the classical are the three streams of the Orissan School of Painting. The classical Orissan painting, pattachitras is painted on a specially prepared cloth (patta), coated with earth to stiffen it and finally finished with lacquer after painting, producing motifs in vibrant colours. Pattas are now used as wall hangings. The subject matter of patta paintings are closely connected with the Jagannath cult and the episodes from Ram and Krishna life. Pattas showing in scenes of Rasa Lila, Vastra Haran, Kaliya Dalan images of Lord Jagannath musical themes of eroticism, nature and wild life and sets of ganjapa cards, small circular cards made in sets of 96 discs, executed in vigorous folk style are special. The traditional chitrakars (painters) have the honour of painting the Puri temple deities and their chariots (cars) every year. Palm leaves (Chitra pothi) have long been used as writing materials. An exclusive indigenous tradition of Orissa, the craft of palm leaf manuscripts dates back to the medieval period. With the help of an iron pen orstylus (lohankantaka), the artist first inscribes the text or design on the surface of palm leaves, then applies a paste of tamarind seed, oil and charcoal. When the residue is rubbed off, the groove stands out distinctly. Usually the legends of the Mahabharat and Ramayan, images of gods and goddess, the nature and wild life themes are presented. The visual effects are enhanced using the vibrant vegetable and mineral colours. Romantic figures drawn on small leaves now serve as book marks, greeting cards and playing cards. Of late, the traditional artists clustered in the village of Raghurajpur, about 50 km from Bhubaneswar have revived this art from. Originally, Pattachitra artists were settled by the Gajapati King of Puri to paint divine trinity on specially treated clothes to be hung inside the sanctum of Jagannath Temple for the darshan of devotees during Anavasar (retirement in seclusion) when the Lord steps out of the temple alongwith brother Balabhadra and sister Subhadra to mingle with the masses, the occasion of annual Rath Yatra. Originating from this tradition, this art developed and gained popularity. The village of Dandasahi near Raghurajpur has been identified as another centre. Ananta Moharana and his son Panu Moharana together have added some new elements to Patta paintings. Pata Chitra Katha is basically an ancient form of story telling, that incorporates very raw and down-to-earth visual narrative, along with oral/aural presentation in the form of songs/chants. I came from an area that you may hear of 'Bengal', where this genre of archaic tradition still exists, but lost some of its aura. I used to know a few people who survives only with this art, but I lost contact with them. However, if you anyway visit Bengal by any chance, (or visit virtually as we do these days) we may find some of them. But please don't impressed by mere 'exotic' stuff, that they use for survival. Patta Chitra means scroll paintings. Katha is a story. The scroll paintings tell stories, which are sung as the scroll is unfolded revealing panel after panel which illustrate the song's words. the Cuckoo's Call blog has an article about Patta Chitra with a video and photo showing a modern one telling the story of rebuilding after the tsunami (of December 2004) created by Rahim, son of the blog author's friend patua Dukhushyam Chitrakar. The scrolls are by various artists, all of whom by convention share the surname Chitrakar, meaning painter, whether actually related or not. The Patuas continue to explore the timeless and the transitional, commenting on how our worlds are being transformed for worse or better, telling fragments of our human predicament." the tradition of pata-chitra may be found in orissa and west bengal. the practitioners are called patuas (or chitrakaars). the tradition is still alive. the bengal pats are more vigorous. the video on facebook is based on the palm-leaf drawings of orissa. the pata-chitras on cloth use colours. there are a few scholars who have researched this and written about it. these include dr. dinanath pathy / dr. j.p.das / dr. jyotindra jain. further details - let me know. On the route from Bhubaneswar to Puri, just a little before you reach Puri, is a turning toward a village called Raghurajpur. There is a sign at the highway marking this turn, which identifies Raghurajpur as a "heritage village". This village is full of craftsmen from the tradition of patta chitra katha; and if you go there they will allow you into their homes and seek to sell you their wares. They are also quite willing to talk about and demonstrate their craft (unless you are fluent in the language, you will need an Oriya interpreter). However, one should be warned that the craft has not remained within the traditional idiom. Firstly the work now is more on paper than on cloth. Secondly they use chemical pigments rather than the traditional vegetable pigments; as a result of which the colours are far more garish. However, if you are patient and willing to spend some time going from house to house, you will come across some pieces of spectacular work. You will also come across a few old pieces on cloth done using vegetable pigments. Pata Chitra Katha is an art that is still alive and well in southern West Bengal, Orissa and Bangladesh. There are many scholarly works on this art of scroll painting accompanied by musical and chanted commentary. "Chitra Katha" means "picture tale or story or talk" and "pata" or "patta" (pronounced "pot" or "poto") means a "scroll". It has nothing to do with films in this context. 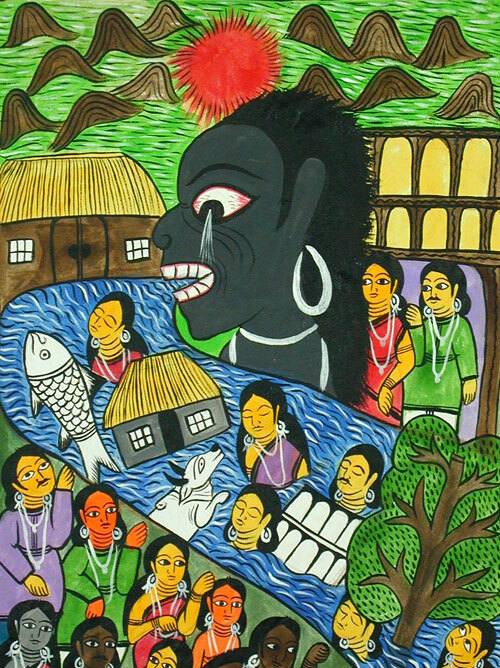 You can google "scroll painting pata" for some interesting links including one to Banglapedia - which is a kind of Wikipedia for things Bengali. Regarding the use of vegetable dyes. Some "patua"s (makers of pata paintings) or "chitrakar"s (painters - lit. picture makers) in West Bengal still use the traditional dyes and techniques while others use commercially made paints. The subject matter of patas has changed. There are contemporary patas on, for example, the evils of dowry, the need to universalize education and so on. The government has used patas to spread such social messages in areas still inaccessible and/or lacking electricity. Patas are also wonderful examples of the the syncretic culture of Bengal. Many patuas are Muslims who paint Hindu folk tales and take on a Hindu name, using "Chitrakar" (see above) as a surname - so for example, someone with the name Salim Ali may take on the name "Ajit Chitrakar". Patas are also made by Santals. Anyway, I mustn't bore you with more on this matter which has been a subject of fascination to me for the last 30-odd years. Do write to me if you want more information on this fascinating folk art form. And good luck with the painting on cloth! In karnataka, the finely made of leather ,colored with natural dyes, are the two dimensional puppets used to tell the stories /epis, known as togalu bombe kunitha, this can be seen at the Chitrakalaparishath, Near shivananda circle, bangalore or also in villages of Shimoga dist, Light source is used to bring out the finesness and grandeur of the story telling , as the puppets come alive and dance to the rythm and songs. In Bengal, there is a village of patua artists in Midnapur district. Jhalpala theatre group active in children's theatre in Bengal does collaborative work with Patua artists and performs at different theatre spaces doing plays for children in Kolkata and other places. thanks very much to everyone who provided links and information and suggestions for further research! it's a wonderful style of art & I'm glad that it's still being practiced even if the materials have changed slightly. Palm leaf manuscripts may go digital article in Times of India, about a digitisation project that the Tirumala Tirupati Devasthaanams (TTD) is contemplating. a wooden box of Udupi‚Äôs Palimaru Mutt, is now being digitally stored forever. to preserve the manuscript for the future generations. Palm Leaf Painting or Patta Chitra is an ancient art form, which was practiced in quite a few regions of India. If it was known as patta chitra in Orissa, the Tamilians called it Olaichuvadi. This art form was an offshoot of written communication on palm leaves. In the pre paper days messages and letters were etched out on palm leaves and dispatched. Slowly the text began to be embellished with illustrations. Theses illustrations became an art Form itself. A single painting takes around 8 weeks to 15 weeks time depending on details of painting. Rows of same sized palm leaves are first arranged together and sewn. These neatly sewn palm leaves are then folded in such a way so as to make a pile. These paintings are first etched out, which means that the designs and images are neatly etched on the surface of the palm leaf using a sharp pen like object. Ink (or a concoction of charcoal of burnt coconut shells, turmeric and oil) is then poured along the lines; the lines are now defined. Vegetable dyes are also added to give these paintings some color, but these paintings are mostly, dichromatic (black and white). The panels of the paintings are unfolded like a fan to reveal a beautiful patta chitra. This ancient art form has found admirers far and wide. Not only does the intricate designs and aesthetic depiction of Gods and Goddesses attract ones attention, the use of the leaf adds to the quaint charm of the Art form. This form painting is hailed as very eco friendly too. Today there are small towns exclusively dedicated to this art form in South India. Ganesh is the Hindu God of knowledge and the remover of obstacles or God of elimination of troubles. He is also called Ganapati (leader of people), Buddhividhata ( god of knowledge ), or Vighnahara (god to remove obstacles). He is one the most important Gods in the Hindu religion so that all sacrifices and religious ceremonies, all serious compositions in writing, and all worldly affairs of importance are begun with an invocation to Lord Ganesh. Size - 15.4 " x 12.4 "
* The painting is unframed and will be sended in safe packing. Disclaimer - Descriptions for products are taken from scripture, written and oral tradition. Products are not intended to diagnose, treat, cure, or prevent any disease or condition. We make no claim of supernatural effects. All items sold as curios only.